A few days ago I was offered the opportunity through MyBlogSpark.com to do a review and giveaway for new Pillsbury Grands Mini Biscuits. I readily agreed and was sent a nice package with a bread basket, butter dish, spreader, a coupon for a free package of Pillsbury Grands Mini Biscuits, and a $15 Visa gift card to facilitate my review. I guess I could have purchased regular Pillsbury Grands frozen biscuits, but that wasn't the purpose of this promotion. I love trying new products, but sometimes it takes forever for those new products to trickle down to the country area where I live. So I thought I wouldn't be able to do this review/giveaway at all, which was a little depressing, let me tell you. MyBlogSpark is one of the better promotion companies to work with and I just knew this would be a "black mark" on my record with them. Imagine my surprise - and shock! - when I received a next-day delivery box of two packages of frozen Pillsbury Grands Mini Biscuits packed on dry ice!! Yes!! MyBlogSpark came through for me!! I couldn't wait to heat up the oven and try the Pillsbury Grands Mini Biscuits. They are tiny when frozen - they are not much bigger than, say, a poker chip. And quite flat. Huh. "Mini" they certainly were, but how in the world would they live up to the name "Grands"?? Boy, was I surprised when I took them out of the oven! They had nearly tripled in height (not circumference - they were still about the size of a poker chip around) and were baked to golden brown perfection. They were cooked perfectly, and I have to say they tasted nothing like "canned biscuits". I daresay these minis can rival even homemade! Just a little crispy on the outside and tender and flaky on the inside. I spread some butter on a couple and couldn't resist tasting them. Delicious! They were even more delicious when I spread some of my sister's homemade blackberry preserves on them! I'm very pleased with Pillsbury Grands Mini Biscuits and will definitely be buying more. If you are a single or 2-person household, you will see the savings of buying the minis in the resealable frozen package. They are small, yes, but just the perfect size for one or two people. And the perfect size for tiny hands, too! I'm going to try them as dumplings in stew later this week. I figure I can halve or quarter the Minis and drop them into bubbling stew for instant dumplings. And there are oodles more recipes that you can find here. ~~GIVEAWAY~~ One lucky Shady Lady reader will win the same Pillsbury Grands Mini Biscuits package I received, including a $15 Visa gift card! Lucky you!! This giveaway is open to US residents only please. ~~Mandatory~~You must follow my blog with Google Friend Connect. That's it! Just leave a comment below saying that you follow. Not a follower yet? It's not too late! See the gadget on the sidebar? Just click "Follow" and you can be entered into this giveaway too! Easy! This step is required before extra entries will count. *One extra entry if you friend me on Facebook. Current fans/friends/followers qualify also. Get a bonus extra entry if you share this giveaway on your Facebook page. #Giveaway at Shady Lady: #Win Pillsbury Grands Mini Biscuits gift pack incl $15 Visa GC! @tnshadylady http://bit.ly/dADRW0 ends 11/14 PL RT! *One extra entry each if you are a subscriber to my email updates and/or rss feed. (see sidebar) Tell me what email address and/or reader you use. Current subscribers qualify also. *One extra entry if you visit the Pillsbury recipe website and tell me a recipe you found there that these Minis would be perfect in. *FIVE ENTRIES - Help me spread the word! Post this giveaway on your own blog or giveaway site or linky. Leave me a link so I can verify. Be sure to leave five separate comments. 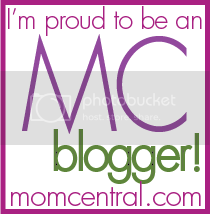 *FIVE ENTRIES - Post my button on your blog. It must be on your main page. Leave a link so I can verify. Be sure to leave five separate comments. Giveaway closes midnight CST Sunday November 14, 2010. Giveaway open to US residents only please. Winner will be chosen by Random.org and notified by email. Winner will have 48 hours to respond, or another winner will be chosen. 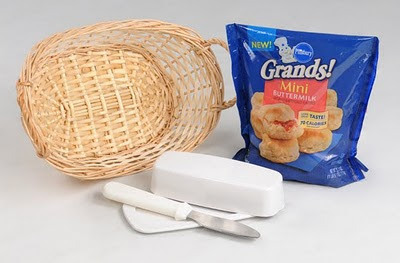 Disclosure: I received a Pillsbury® Grands!® Mini Biscuits prize pack which included a VIP coupon good for a free package of biscuits, a $15 gift card to purchase recipe creation/experimentation needs, a biscuit basket, a butter dish, and spreader. The prize pack and information were all given to me from Pillsbury through MyBlogSpark. My opinions are my own. I'm an absolute slug in the mornings. Until I've had my coffee, don't even talk to me. I won't respond. Or if I do respond, you might not like what I have to say. Can't help it. Been that way all my life. Don't like it? Bite me. I might even tell you that too. But now I don't have to actually say it. I can give you a graphic illustration. That's a piece of toast, in case you can't tell from the picture. And it has "Bite Me" burned right into it. Now I don't have to actually talk in the mornings until I'm good and ready (which may be a while, so pack a lunch). Morning Bytes Gift Set that would make the perfect gift for someone you know who doesn't do mornings either. PopArtToasterStore.com sent me this amazing toaster set to review and I have to tell you, I haven't had this much fun in the morning in a long time! Love the soothing retro color and look. And so easy to use. It's a regular toaster, only better. The secret to the design is interchangable metal plates like the one I'm holding below. These plates simply slide down into the toaster in metal slots and the rest is automatic. Nothing could be easier! When you engage the toaster (just like a regular toaster, by pushing down the lever on the end) the bread slices are toasted like normal on one side, but the side next to the center of the toaster - next to the special plates - comes out with the fabulous design on them. Yep, that's me in the morning! 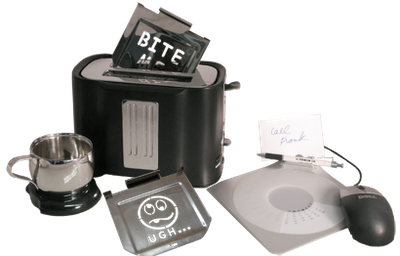 The toaster comes with two design plates, "Bite Me" and the "Ugh.." un-smiley face. You can also easily remove the plates in case your in-laws are coming for breakfast. Or not. Your call. 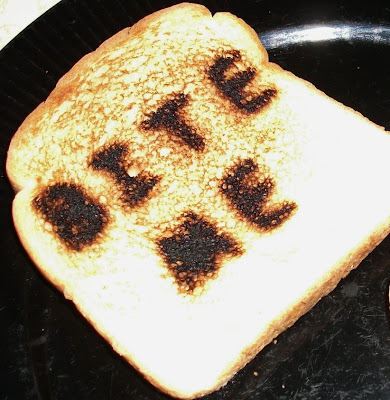 Just don't come crying to me when you serve your mother-in-law toast that says "Bite Me". The toaster also has seven heat settings, but the recommended setting is between 3 and 4, which is what I used for the above pieces of toast. You can adjust to your preference, of course. I happen to like mine almost burnt, really crispy. This toaster does a wonderful job. Don't let the design and special plates fool you, this is still a toaster and it works beautifully. It also has this really handy slide-out crumb tray that makes cleanup a breeze. You know how some toasters have a little door/latch on the underside that you swing open to release the crumbs and hope you're holding it over the sink or garbage can when you do? Forget that. This tray does the job so much better. Another thing I love about this Morning Bytes Gift Set is the cup warmer that is powered through a USB cable. Yep! No more hunting for an electrical outlet to plug in your cup warmer. Just plug the cable into your computer USB port and keep your coffee warm while at the computer. Love it! All in all, this is one fantastic package for that special person on your gift list who can relate to the "bite me" and "ugh.." sentiments. As a consumer reviewer, I love showing you products like this, but I am also aware of my responsibility. There is one small design problem that I want to make you aware of with this toaster. This is the back of the same toast. See the triangle-shaped indents? The way the toaster gets the graphic impression on your bread is by pressing a spring-loaded metal bar (triangular, just like the shapes above) against the bread slice to hold it firmly against the graphic plate. This bar only engages when you engage the toaster by pushing down on the lever on the end. Okay, so maybe "problem" is not the correct word to use here. Let's just say I want you to be aware of this and not leave the toaster unattended, or watch your little ones when they use it, because the bar will continue to hold the bread against the heated plate as long as the toaster is engaged... and if the bread slice is "warped" and preventing the toast from popping up when done, well... you can see my concern. But overall that's a small thing when you look at the benefit of this wonderful toaster. Wouldn't it be great to put a smile on the face of that grumpy non-morning person in your life? And just so you know, there are interchangable plates if "bite me" and "ugh.." aren't quite your cup of tea. There are lots of different ones and each is only $3.25! PopArtToasterStore.com has much more fun in store for you! 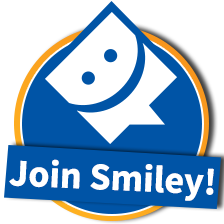 Go take a look at all the great things they offer. I'm sure you'll find something perfect for yourself or for a gift. Disclaimer: I was provided a sample Morning Bytes Gift Set gratis in exchange for providing an unbiased review of the product. (Thanks Dana!) 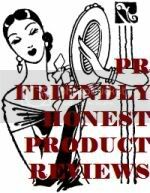 No other monetary consideration was involved, and my review was not influenced in any way.